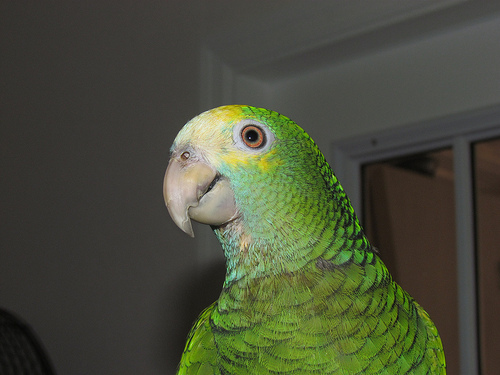 Pets Costs > How Much Does a Quaker Parrot Cost? How Much Does a Quaker Parrot Cost? Over the years, the quaker parrot has shown up under multiple names, including the monk parakeet or grey fronted parakeet. Today, however, they are simply known as a quaker. Along with these different names you may have heard of, they come in a variety of colors as well, including a sky blue color, yellow, white and lutino to name a few. The cost of a quaker parrot, as with most captive parrots, will depend on the mutations/colors, rarity, the breeder you choose to work with, where they live, the age and the gender of the bird. From our research, the average price for a high-quality common quaker parrot can range anywhere from $250 to $550 each before shipping. In some cases, you may be able to purchase a pair for as little as $450 total. A rarer blue quaker can cost closer to $700+. Before considering a purchase, however, make sure you check your local state laws as some states do outlaw these birds as a pet due to the possibility of being a threat to crops and local agriculture. According to BirdFarm.com, they are outlawed in California, Connecticut Georgia, Hawaii, Kentucky, Pennsylvania, Rhode Island, Tennessee and Wyoming. Some states, such as Ohio, have strict laws if you were to own one such as a mandatory wing clipping. BirdBreeders.com, a popular online bird-only classified website, had about 20 active listings at the time of this publishing, with prices ranging from $292 for a monk parakeet to as much as $675 for a proven pair of blue/green split quaker parrots that were three years old. Most breeders, from what we saw, would charge an additional charge for shipping and almost all of the birds were weaned/hand fed and ready to go to a good home. BirdsNow.com, another birds-only classified website similar to BirdBreeders.com, had almost 200 active listings at the time of this writing, with the prices greatly varying from $250 to $550. On this QuakerParrots.com forum thread, multiple members discussed the costs they had paid for their quaker parrots. According to most of the responses, the prices were all over the place, ranging anywhere from $195 for a blue mutation, which tends to be the most common, to as much as $800 for a rare mutation. Some shoppers have reported Petco offering a blue quaker parrot for about $900, but the availability greatly depends on the region and the availability. A well-balanced diet is crucial and should consist of a variety of seeds, commercialized pellets and small slices of fruits and leafy green vegetables. Owners are also encouraged to feed their birds calcium supplements and offer hard-like objects for the bird to peck at throughout the day. Since these birds love to chew and peck at items throughout the day, a stainless steel cage is highly recommended to prevent the bird from ruining the cage. The cage, which should be as large as possible, should measure at least 18″ x 18″ x 18″. Known to be escape artists, the spacing between the cages should be kept to a minimum, with experts recommending a 5/8-inch spacing requirement. At the bottom of the cage should include a metal grate with some sort of substrate to catch any of the bird’s droppings. As these birds are messy, the cage should be cleaned weekly with a good scrub down of the boards and floors. The substrate should be cleaned at least once a week as well. The quaker parrot is primarily green with grey feathers on both the forehead and the neck, with the wings displaying a hint of blue. Other variations include blue and a very rare yellow. The bird, when mature, measures nine to 11 inches long, with a 10-inch wingspan and average weight of 3.5 ounces. In captivity, the quaker can live 30 to 35 years with a well-balanced diet. They are known be very inquisitive, playful and are known to be extremely good talkers, able to mimic words, songs and even whistling patterns, with most learning how to speak in about six months. They are also known be playful, engaging, mischievous and very active. Known to form tight bonds with their owners, they are known to be quite devoted. Interaction, as with most captive parrots, is extremely important as you want to avoid the domineering behavior some quakers are known to exhibit. They should not be left in their cage all day to avoid boredom and behavioral troubles and should always have some sort of entertainment as they are very mechanically inclined, meaning they are able to figure out locks and disassemble a variety of toys with ease. Since males and females look the same, you need to consider DNA testing if you want to distinguish the gender. These birds originated from Brazil and Argentina but have also established colonies in some parts of the United States, estimated to be in the tens of thousands. Unlike a lot of exotic birds, the quaker can actually withstand colder temperatures as they have been seen as far north as Illinois. Don’t underestimate the bird’s size. Maxing out at 11 inches in length, the quaker believe they are much larger birds, seldom intimidated by larger birds or pets. The quakers are known for being one of the best talkers in the small bird group, able to mimic many words, sounds and even songs they are taught. Most people know parrots for their “scream,” but the quaker tends to “chatter,” which can raise and lower in sound. Should always show signs of brightly colored eyes and nostrils. Its demeanor should be lively and perky and shouldn’t be sitting on the floor looking depressed. As these birds do like to stay well groomed, its feathers should appear neat and clean when examined. With any bird, they will regularly eat and drink throughout the day, especially during the night and morning. Being social, a healthy quaker will always make noises throughout the day.